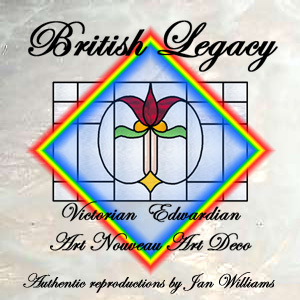 The beautiful and varied patterns in the British Legacy collection are historically accurate representations of 19th and 20th century European stained glass windows. Hundreds of hours have been invested in researching, locating, collecting, categorizing and precisely translating intricate details of these historic works into a resizable digital format that allows today's artisans to create masterpieces ranging from full-scale windows to miniature replicas. This unparalleled compilation includes 76 designs created between 1840 and 1925. You'll find a great deal of diversity in motif, color, complexity and period styles. There is something for all skill levels and interests: simple and elegant geometric designs, the classic tulips and roses of Europe, buds and fleurs de lys, heraldic emblems, as well as a number of holiday wreath and candle designs. Also included are several unique period designs such as a dramatic Galleon design from 1902, a Deco landscape, a highly detailed peacock with over 325 pieces, and a fantastic Chinese dragon.